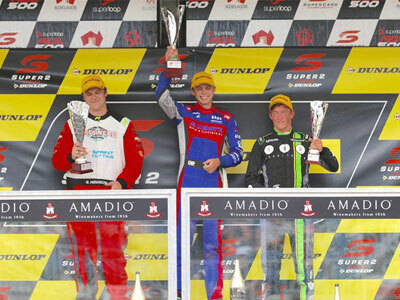 Bryce Fullwood has started the 2019 season in superb fashion, claiming his first win in the Dunlop Super2 Series at the Superloop Adelaide 500. The win was a massive boon for Bryce, as it was his best race result since his maiden round podium finish at Newcastle in 2017. 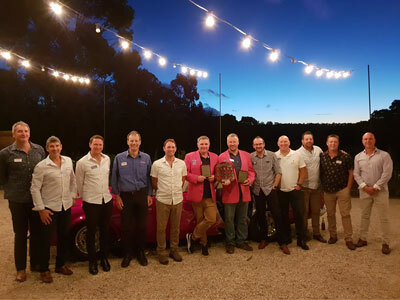 On the 20th February, Middy’s Annual ‘Sales Representative of the Year Awards’ were held at the picturesque Glen Erin Vineyard in Lancefield, for the 5th consecutive year. The occasion brought together our sales representatives from across the country to collectively celebrate the team’s efforts, as well as the outstanding individual performances. 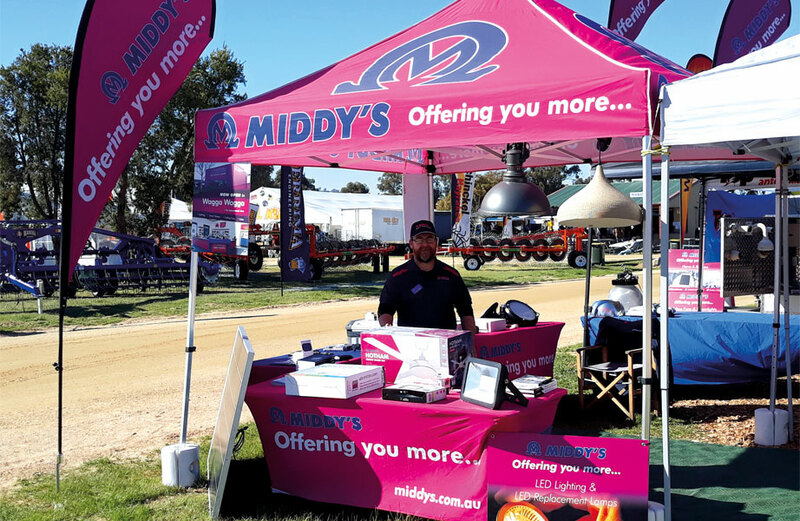 Across three days in September, Middy’s held an exhibit at the Henty Machinery Field Days, home of Australia’s premier mixed farming event. Written on 24 March 2019 . 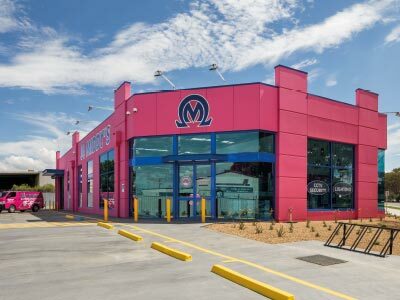 Middy’s Meadowbrook branch in Queensland was recently burgled and we’d like your help to catch the criminal responsible. 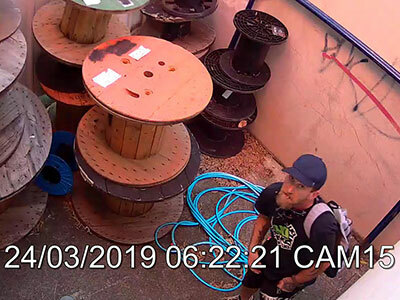 On Saturday 23rd March 2019, a caucasian male, aged 20 to 30 years and believed to be a local, burgled the Meadowbrook branch 3 times in the same day. Written on 28 February 2019 . Kicking off on March 21st, the Middy’s 2019 AFL Tipping Comp offers over $19,500 in cash prizes and it’s free to enter. 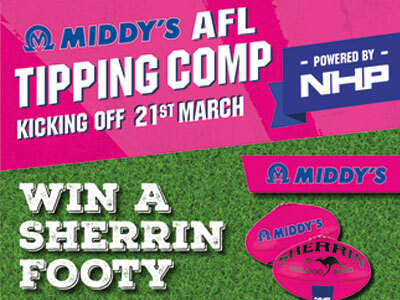 You also have the chance of winning a custom Middy's/NHP Sherrin Footy. 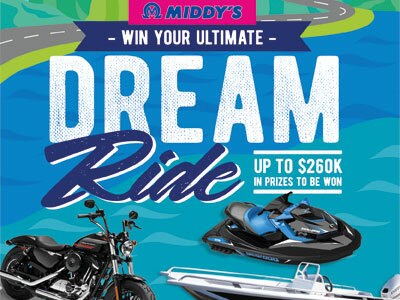 With up to $260K in prizes to be won, our biggest promotion to date gives you the chance to win a Boat, Harley or Jet Ski to the value of $20K. Spend $1000+GST on any Clipsal/Schneider product on one invoice & go into the draw to Win your dream ride. 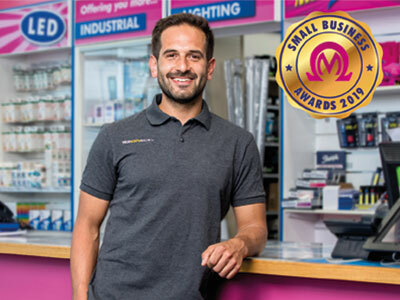 The Middy’s Small Business Awards are back for 2019. Running nationally from March to May with $30,000 in cash to be won. Times are changing and our habits around single use plastic bags are changing. 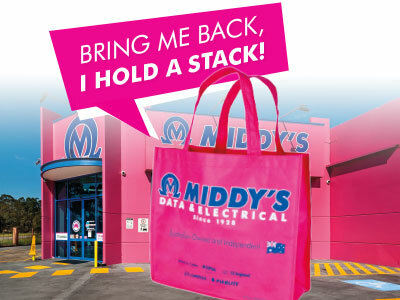 Middy’s branches nationwide are aiming to eliminate the use of disposable single use plastic bags. We will be moving over to re-usable tote bags soon and will be providing them to customers to keep and re-use for future purchases. Welcome to our new Wangaratta Branch. 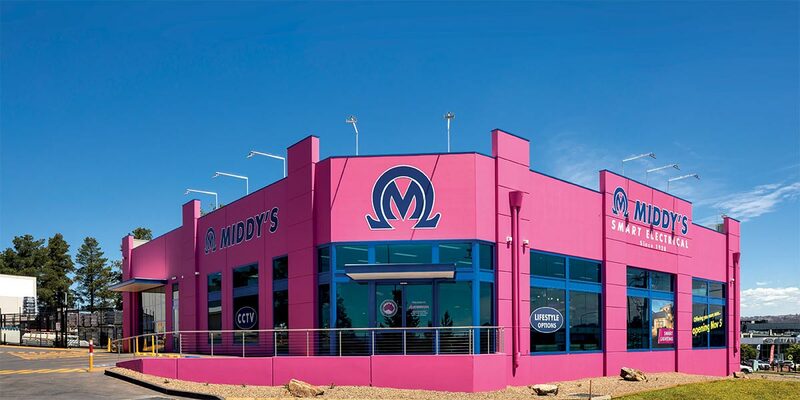 Middy’s has been servicing the Wangaratta and surrounding areas with our branch at 49 Tone Road for 18 years. We are now proud to announce our relocation to our new company owned and built branch, just up the road, at 15 Tone Road which occurred on the 17th of December 2018. Written on 04 December 2018 . Written on 30 November 2018 . 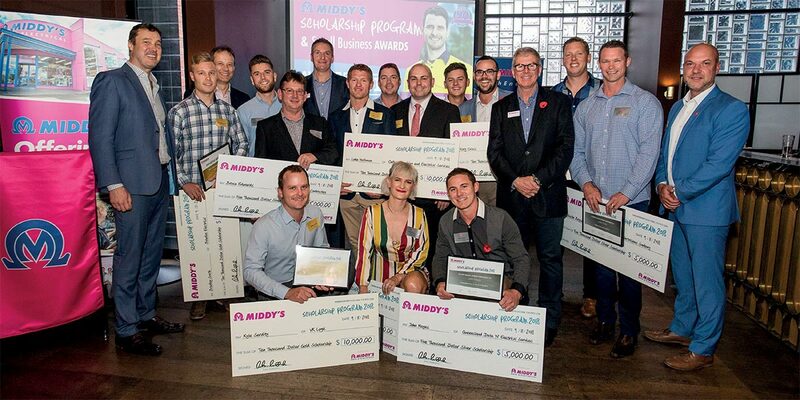 Industry training worth $100k has been awarded to 13 worthy recipients at the Middy's 2018 Scholarship Awards Night. Held on the 9th November at the Garden State Hotel in Melbourne, the winners and their partners celebrated in style with canapés and drinks alongside Middy’s directors, staff and industry leaders at our gala presentation. Once again our judging panel had a monumental task in deciding the winners for 2018 and would like to congratulate everyone who took the time to apply. Many of our winners were previous applicants who had not been successful in the past… so keep your eye on the prize and come back next year. Written on 29 November 2018 . 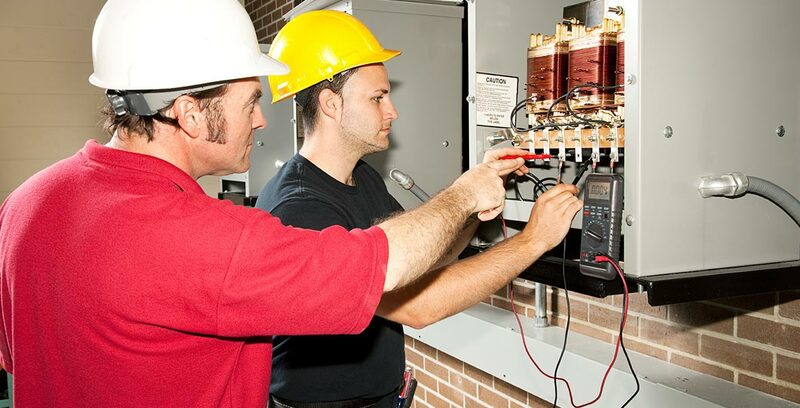 Recognising and rewarding the small electrical contractors in our industry. The inaugural Middy’s Small Business Awards have now concluded and we'd like to thank everyone who applied. There was $30,000 in cash prizes to be won. 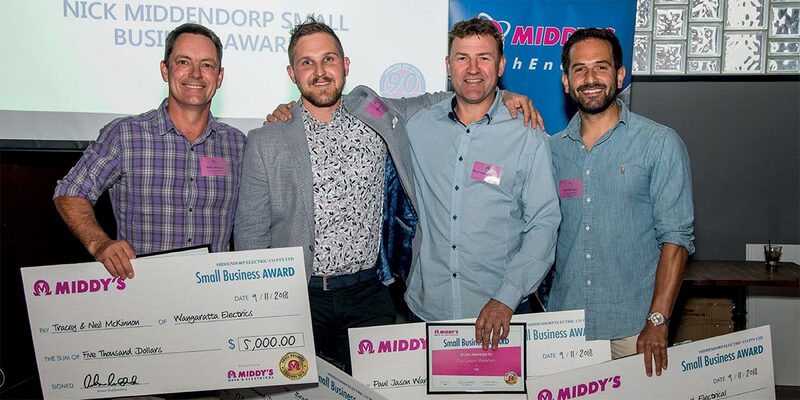 The winners of the 4 x $5,000 Awards were invited to the Scholarship Awards Presentation Night on November 9 where Ashley Flegg was presented with the $10,000 Nick Middendorp Small Business Award. Written on 28 November 2018 . Welcome to our new Fyshwick Branch. Middy's hosted 104 guests at one of Queensland's biggest nights of the year from the best seats in the house. Sunsuper Riverfire celebrates the end of three weeks of Queensland’s largest arts and cultural event, wrapping up the Brisbane Festival with a bang. 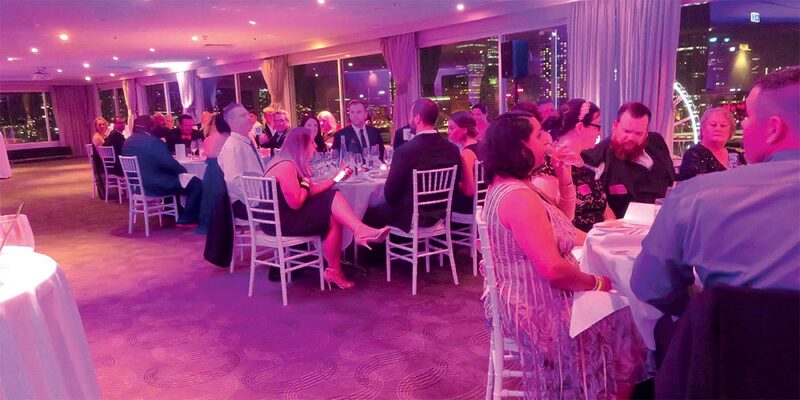 On Saturday 29th September the Middendorp family and staff held a VIP event on the rooftop at Rydges Southbank which offered 180 degree views of the Brisbane River and a stunning view of the spectacular fireworks display. Written on 26 November 2018 . 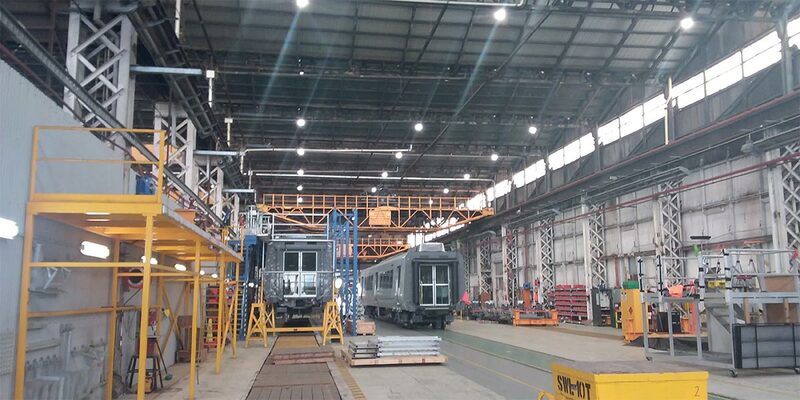 Middy's Ballarat Sales Rep, Jason Ryan and TechEnergy Rep, Leigh Stacey approached Alstom Transport at their manufacturing facility in Ballarat to discuss the benefits of an LED Lighting changeover and offer a quote and ROI on their existing 290 x 400W Mecury Vapour Highbays.